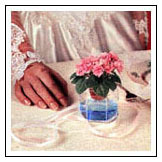 Optimara Miniature Violets add a beautiful and meaningful accent to weddings and other special occasions. As a symbol of friendship and loyalty, African Violets represent those virtues which will always bring people together. At your rehearsal dinner or reception, Optimara Miniatures endow your place settings with warmth and color. They are available in an array of colors to complement any motif. Select from white, pink, blue, purple or any combination of colors. Optimara Miniatures are even available in bi-color varieties. Each Optimara Miniature Violet comes with its own self-watering MiniWell. 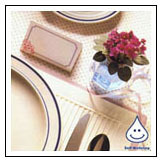 The MiniWell is made of clear, crystal styrene, making it suitable for even the finest dinner ware. And because the MiniWell takes up no more space than a wine glass, Optimara Miniature Violets are the ideal size for any dinner arrangement. While Optimara Miniature Violets bring color and beauty to your place settings, they also give each of your guests a very special keepsake. Optimara Miniatures are a wonderful way of expressing your appreciation to all the friends and family who share in the occasion. And because they are self-watering, you can feel assured that Optimara Miniature Violets will provide your guests with a lasting reminder of the graciousness and generosity of their host. Optimara Miniature Violets are available at quantity discounts for orders of 24 or more. In addition, you may want to consider centerpieces to coordinate with your Optimara Miniatures. Use standard 4-inch Optimara Violets to create your own arrangements, or ask about the Optimara MiniGarden or Dish Garden. Though Optimara Miniature Violets are available year-round, please plan ahead. For prices on specific quantities, visit your local Optimara retailer or contact the Selective Gardener at http://www.selectivegardener.com. In addition to quanity, let them know your preference of colors and the date of your event. A representative will contact you with all the information you need.